Last week was a star gazing at its finest. We're not talking about the usual celeb sightings that you routinely get at Century City, but rather we speak of the bloggers sightings! Seriously, how often do you see Bloggers in the middle of Mid-City other than Beverly Hills. We're also not talking about Blogger proms or blogger conventions where bloggers meet bloggers, but rather an Average Joe coming to a restaurant will instantly know these camera hawks are not up to no good like some paparazzi. Instead of worrying about which designer brand was the movie star wearing or which music star is shacking up with which reality TV wannabe, what most people wanted to know was: which camera is the prefer choice of the blogger and more importantly.... which lens are they using? Big names was lounging around the outdoor mall of the Westfield Century City Mall waiting to be seated where I spotted Oishii Eats (sans her hubby, ahh C'mon D!). Many have arrived early with much anticipations and have been seated where luminaries such as kevinEats, Only Eat What Feed Your Soul, The Foodie Traveler, My Last Bites, and supposedly When Tara Met Blog who arrived much earlier have all gotten their tables. Our table was no slouch in filling in with the big shots such as LA & OC Foodventures, E*Star LA, Hey Hey Scensters, Kung Food Panda, Princess Kitty, and Folie à Choisauce. Why the fuss for a blogger party in the Westfield Century City Mall? For one night only, a special dinner prepared by Season 6 Top Chef contestant and current Chef de Cuisine at The Dining Room in Langham Hotel, Michael Voltaggio was able to lure in these types of enthusiastic crowd. Let's get this out of this way as most people will point out the chaotic and spotty service. It was a rough going as some early patrons overstayed and enjoyed the restaurant atmosphere a while longer by ordering more wine. No harm in that. Kitchen was trying to catch up with the food that was ordered. 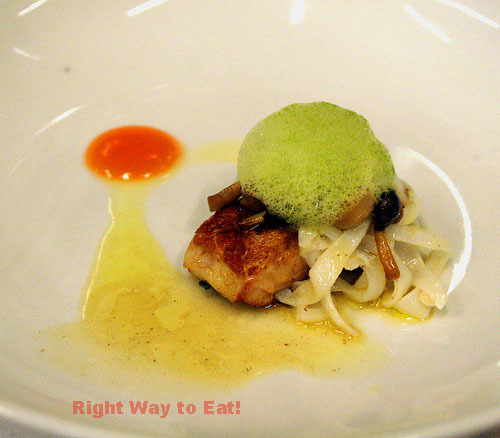 Some were rushed with 4 dishes in the same time and arriving in out of order of sequences. It happens. The background of chef Voltaggio was briefly mentioned in my post about having a picture taken with him when a few of us attended a dinner at his former employment in Saam which is the private room in the restaurant "The Bazaar by José Andrés". Recipient of AAA Five Diamonds Award and finalist for the James Beard Award for Best New Restaurant instantly makes him an uprising star in a town crowded with former Top Chef contestants hoping to make a mark in LA (Ilan Hall, Stefan Richter, Tiffany Faison, Antonia Lafaso, and Fabio Viviani). 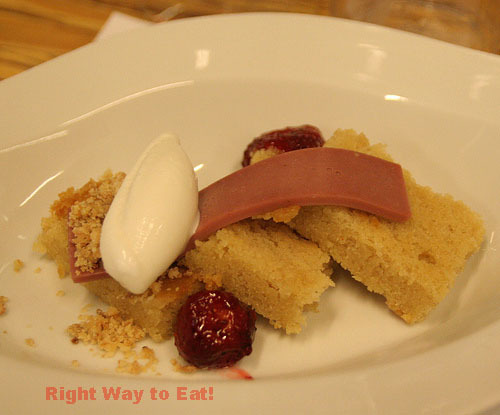 Chef Voltaggio is one of the new wave of chefs who practice molecular gastronomy, but balanced it with modern techniques that favors the presentation and the flavor to match with the ingredients being presented. It was a treat to meet him at The Bazaar where he brings out some unique dishes to his repertoire and many of us were geeked to find out what he might have in store for us when he takes over the duty of chef de cuisine at Langham. 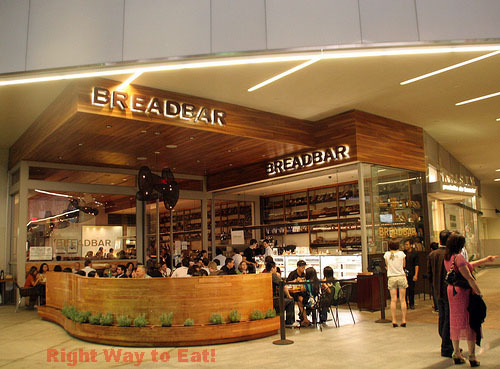 As you can see, his one night viewing at The Bread Bar attracted big numbers of bloggers want to take advantage of the $8 per dish special that was advertised for the monthly Hatchi (Eight dishes for $8 each). The pictures that are posted in the chronic order it had arrived in. 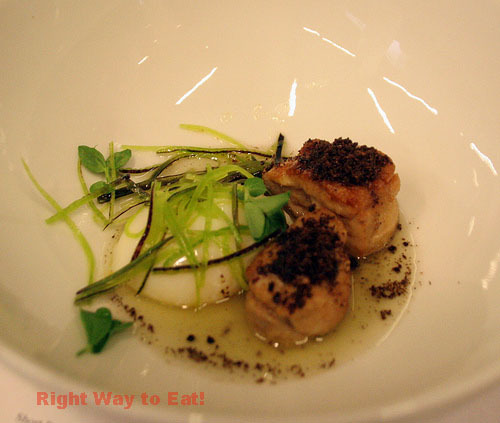 As it pointed out in obviously terms, the Veal Sweetbread was the first to arrive (should be the 4th). 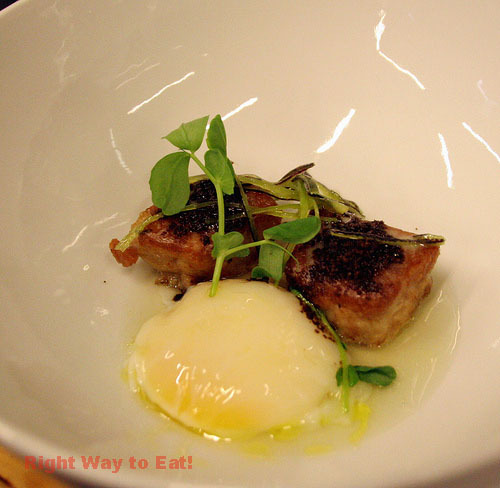 We love the poached egg which was one of the simple dish that chef Voltaggio have stated in Top Chef's bio which he love to create. The coffee cardamom added a sweet contrast to beautifully poached egg and the savory veal that was supposed to be the spotlight. It was the poached egg that won us over. The Japanese Tomato Tartare was a big surprise we didn't expect because we thought there was an egg whites on top of the tomato tartare, but it was rather a thinly disguised Parmesan cheese covers the well seasoned tomato. 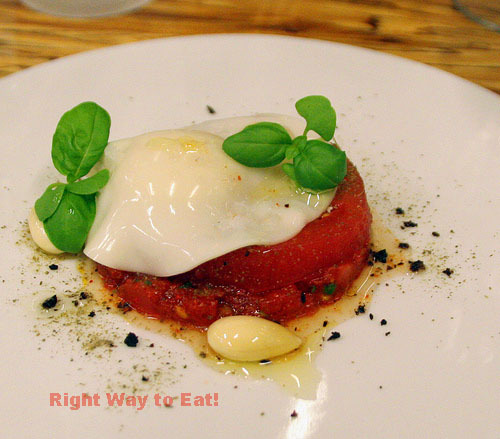 It's well noted that a tomato and cheese substituted for the beef and egg, but it worked beautifully as the light dish starting off early in our course will gradually prepare us for the heavier savory dish that will come up. The salmon and hamachi that followed the veal sweetbread and tomato tartare were both provided in a beautiful presentation. Both dishes were greeted with the accompanied vegetables in a well thought out plate that will highlight the flavor profile of the dishes. 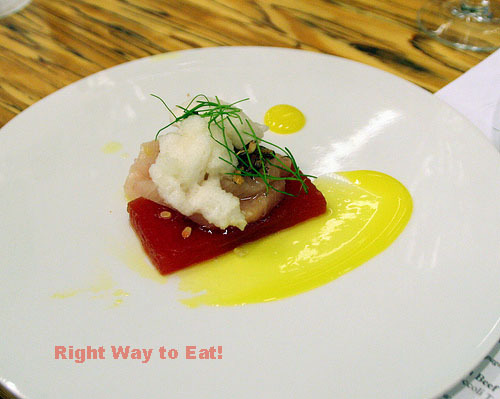 For the hamachi, it was on top of a fresh watermelon with a dash of egg yolk for sauce. Being fresh as it was, the hamachi being mixed with fresh components would just melt in your mouth and you still can take in the flavor for a bit while after your initial bite. 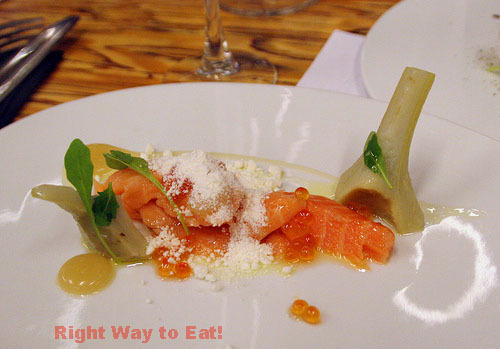 The salmon belly with cheese was a strange choice for mixture of flavors, but sandwiched between the artichoke, it did taste very smoothly with the amount of balance. It did seemed to look like a cream cheese on a sushi, but it worked out much better than my initial reaction. 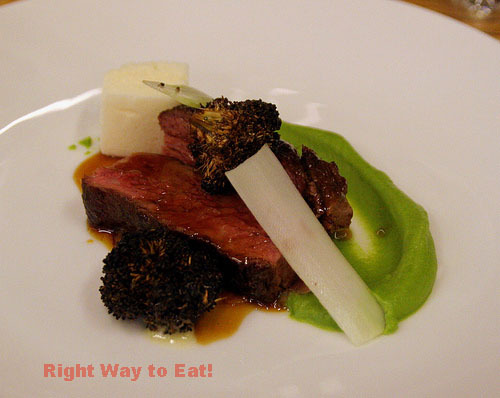 Wagyu Beef - Short Rib, Saul's Pastrami, Tamarind, Broccoli Textures, Horseradish "Styrofoam"
How did the final two savory dish worked out? It's too bad that Veal Sweetbread went first because it was suppose to join these duo as part of the bigger middle of the line up. Here's the magic for the Crispy chicken with cuttlefish, it tasted great with the Belgium beer that was provided to us by the head of the service staff. No joke, the beer washed down beautifully of the well cooked crispy chicken and the tender cuttlefish (looked like a string of noodles) and was the best pairing of the night in terms of which alcohol beverage goes great with which dish. If we can figured a savor dish for Fat Tire, I'm all in. The Wagyu beef with a string of pastrami underneath had a sweet sauce lavished over both of them. For kevinEats, it reminds him of a Tamarind sauce, for me I thought it was of sweeter soy sauce. I make sure to get a piece of the horseradish Styrofoam that was shaped like a sugar cube and toss it in to the green broccoli sauce, both would counteract against the sweet sauce that was on the Wagyu beef. Hot off the stove, the beef was tender and the pastrami underneath serves as a great wrapper around the ingredients and beef. Both dishes ended well for us before the desserts as the food served as a memory loss potion for the earlier chaotic service we have gotten. The desserts both have its moments and was the closer for the night. The fool's gold was a playful reenactment of a dish that resembles the great find of the gold rush, except this was better than your average gold findings. The chocolate mousse and the salty caramel was going to be an appetite killer if you started it off with those two combination. Make sure you get hazelnut praline first before frolicking in this "fool's gold". It's not the ice cream you thought it was going to be. Luckily some of us decided to get started on the Miso cake first before further digging on the fool's gold. The miso cake had an interesting component on the plate which confuses me as a slice of spam. On further inspection, it was a sliced of savory ham that mashes with the sweet rice cream. Before we continued, we decided to drink the last two pairing of the wine to see if compliment well with the desserts. Lo and behold, it actually did served as a great elixir to mix the flavor profile of sweet and savory very well. The fool's gold of salty caramel still need to be eaten last, but at least we know something can counterbalance that after taste. Overall, all of us did enjoyed experiencing the dishes that chef Michael Voltaggio have to display before his big move to Langham Hotel on the same week. It's enough of the preview we needed to make a visit to the Dining Room in the near future. Weird arrange of order of dishes at first, but all well that ends well is what it matters. As in for the blogger meetup in the Bread Bar, I cannot tell you on how many passerby have remarked that "it's probably a Blogger convention" when they see a half dozen cameras going on simultaneously in the same table whenever a dish come out. For one night, it was exciting to meet the superstars of the Foodie Bloggers world all arriving to the same arena for the same adventure. Similar interests with different methods are all on display. You can say it's one of those party where everyone shares their crafts and trades to the similar enthusiasts. I can only hope another all-star meetup that can exist in a tiny arena happens in the distant future. That was a great event! Thanks for letting me relive it! I'm pretty satisfied with my old point-and-shoot. All you real bloggers have passed me long ago with your fancy DSLRs. Did anyone get any shots of people taking pictures? That would've been a sight! Where was Oishii Eats seated? I've never met her before. Also, Refined Palate was present as well. Your photos are looking sharp, Mike! Bloggers are a crazy bunch, aren't they? Great photos, mister!! Wow!! And it was fun to meet you in the best setting possible. 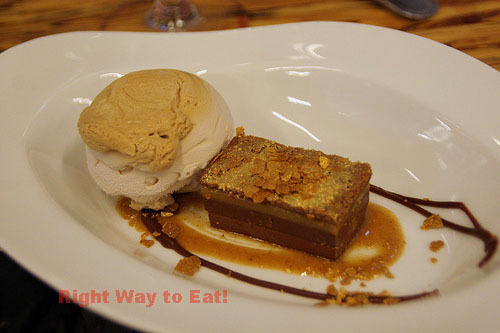 Oh, as far as dessert - I really loved the miso cake too! Ugh still so jealous I missed this dinner! Did you see Top Chef on Wednesday? I didn't get a shot anyone taking food photos, but I know tons of people were staring at our table because we have six people with cameras all taking photos simultaneously. It was a sight for them to see! Oishii was sitting in a bench where her back is against the front door. Thanks for letting me know about Refined Palate. I would have love to meet her. Yeah, we crazy bloggers are a crazy bunch. Thanks for the awesome compliment! It was awesome meeting you as well and in a very good meal to match. Hope to bump into you again! It's a bummer you missed this one because it was a big convention in our usual environment of a restaurant. Yes, I did watched it. I'll have to re-watch it again to memorized the contestants. The only ones I remembered is just Michael Voltaggio and his brother. The winner of the elimination challenge is a James Beard Award nominee as well. So it'll be a tough season for these group.